I really think it would do me a world of good to just get away for a while. I don't mean permanently, I just need a change of setting. Everything in this town and the ones surrounding it on all four sides reminds me of something from the past that I don't want to be reminded of. Like where her father and I used to go to the movies. Hell, the highway that leads to the movie theater reminds me of him, only because that's the only way we used to go and everything else I do (work, school, friends, etc.) are all located on a different stretch of the highway. Or the place we used to go to work on his car (all three of the towns his garages have been in while I knew him), or the place we met, the beautiful lake/forest/whatever it is where we were the first time he kissed me, the Chili's we always ate at, the hotels we've stayed at....just everywhere. Then there's the really tough places to drive by...the OB/GYN office where I had my ultrasounds, the hospital where I had her, the road in Boston that leads to the adoption agency....UGH! I know if I leave, even for a little while, my 'troubles' will follow me. I know that. I don't think that some magic fairy would descend upon me and erase the past four years of my life..and I wouldn't want that even if it were an option. My relationship with him and of course the birth of my daughter have changed my life dramatically, but they've both molded me into who I am today (or, should I say, who I want to be. Because right now, I'm a mess - and that's putting it nicely). Anyhow, I lost track of where I was going with that, but the bottom line is, I need a change of scenery. I want to be away from the memories because I still need time to heal. The end of a relationship is a loss just as much as any other, and I need to give myself time to move on from it. I haven't even fully processed it yet, because I was (and am) so wrapped up in my little girl. Almost every thought I have every minute of every day is about her. I've heard that the first year is the hardest, so I'm not beating myself up over it. Hopefully I won't be this "focused" in another year or so. I don't think that a day will ever go by that I don't think of her - even if I'm married with four more kids, I don't think a day will pass without her in it. And she will always be in my heart, I have no doubt about that. Her birth father has done a lot of things in the past to hurt me. I may have enabled him at times by putting up with his crap, but he knew what he was doing. We are both responsible for our relationship and where it went wrong, and we are both at fault for not going our separate ways sooner than we did. We tried, a few times, I remember. At the end of 2009, I gave him an ultimatim, basically, and told him that if he didn't change his ways and start taking things (and most importantly, us) seriously, then I was done. I told him we couldn't be friends, because he and I could not exist as 'just friends.' I was in love with him, and breaking up with him would have torn my heart out but being 'friends' would have torn it out and stomped on it. At least this was my thought process back then when I didn't know that I could, in fact, handle more than I thought. Anyways, weeks went on with us doing the same old thing and with me becoming more and more unhappy. Then sometime within the first month or so of 2010, my little girl became 'my little girl' inside of me and we didn't even know it. It's strange to think that if I had just held my ground and stuck to it, he and I would have parted ways last year, and I wouldn't be sitting here now talking about my nine month old daughter. It's one of the many reasons that I believe she was meant to be a part of this world and I was meant to be her medium to get to her family. It's weird. I don't miss him necessarily, I just miss having someone. I want to text him when I see a car that I know he would have liked, a car like the ones we used to see at the car shows we always went to. I want to text him when I hear someone say something that I know would have made him laugh, or when I hear something that pertains to some silly inside joke we had. We had hundreds. I miss him as my best friend, I miss the person he was and the way he and I were when we were just that - best friends. Before we became so much more than that. And even when we speak now, about Arianna, that's what I hear in his voice and what I miss more than anything else we shared...his friendship. I do wish we could be friends. I wish I could feel absolutely no anger, no resentment, no jealousy towards him. I wish that part of me didn't blame him for the fact that I don't have my daughter. I try to act as if I don't, and ultimately I know that it was my decision and it was the RIGHT decision, but there's an illogical part of me that thinks that if someone else had been her father, I would have her here now. Which is a silly thought, because if someone else had been her father, she wouldn't be who she is. To wish that she had a different birth father is to wish that she were different, too, and I love her to pieces just the way she is. Therefore, I know it's illogical to think that way. But anyways, I wish he and I could start fresh and treat each other the way we did in the beginning (minus the falling in love part). Our daughter could still be a part of this world, still live with C + C and her big brother, and still be a part of our lives as much as possible...but he and I wouldn't have this history that we do. Wow, I'm rambling.....again. I love that photo of us. I have probably 10 or 15 photos of she and I together, but that one is one of my favorites. 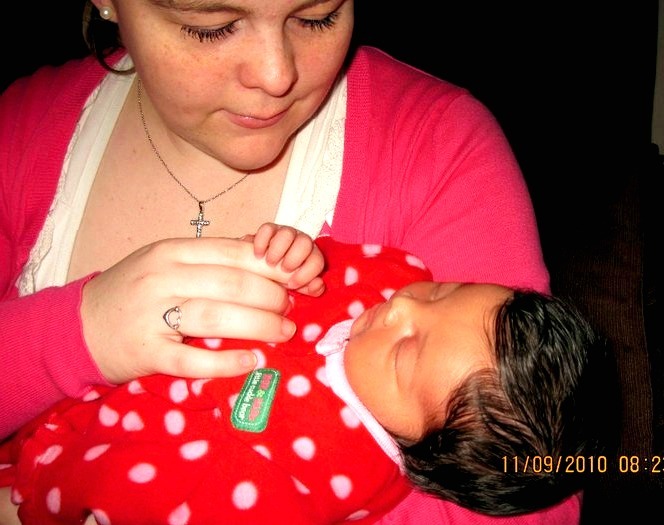 My absolute favorite is the one of me holding her when she was about a minute old. I look a mess, my face is puffy from the intravenous fluids and my hair is a wreck, but that was the most amazing moment of my life, and when I look at that photo it all comes back to me. I experience that love you feel when you first hold your baby all over again. Okay, my hands hurt now, so I'm off to watch an episode of Pit Boss that I DVR'ed last night. If you're an animal lover and don't watch that show, you should! It makes me laugh, cry, and think all at once. Then again, the laughing one minute and crying the next thing comes naturally to me these days...hahaha. Great post, I know it is so, so hard. I was lucky in that I was able to move away from the town I was pregnant in and delivered at about a month after placement. It was a town I had lived in for 13 years so it was very hard to say goodbye for other reasons, not just the baby, but all of the memories were caving in on me and I was sinking like quicksand. I'm not saying that going away or moving is the answer, but not being faced daily with reminders and physical, tangible memories does give you a break. Even if you can start taking a different route to the movies or work (obviously sometimes that is impossible) or find a way to create new ones (find a new Starbucks, or new gas station, whatever it is) that are part of your life now I think it can help a lot. Just creating new routines and memories, even if they are very simple, can help move you forward without you even realizing it. She is such a beautiful newborn. I can't believe how much hair she has and how it is so dark jet black! She will grow up to be such a gorgeous little lady.